Sheraton beckons prospective guests to the Sheraton Addis Hotel in Addis Ababa, Ethiopia with glittering pools, enchanting underwater music and dining options to delight the senses. Employees have recently had a lesson in the seamy side of this enchanting operation. In April last year, the legally-recognized union representing the hotel's workers requested negotiations to renew their collective agreement. In April, management and the union signed a memorandum of understanding with the Federal Ministry of Labour and Social Affairs providing for technical assistance with the negotiations. Negotiations commenced in July and proceeded for a number of sessions in what the government Arbitration Board called "good understanding" - until the hotel management abruptly and unilaterally terminated the process on what the Board deemed illegitimate technical grounds and walked out. Two days later, the hotel issued termination letters to 65 employees, all of them union members, including the negotiators agreed to by management and the union's officers. On July 31, management withdrew from the negotiations after declaring that it was unwilling to negotiate with employees whose contracts had been terminated! In an official communication, the Board condemned the company's "bad faith" and "neglecting and despising the efforts of the Board". The union has issued a legal challenge to these arbitrary and unfair dismissals, but has to contend with a notoriously corrupt and inefficient legal system which offers few prospects of a speedy or swift decision. Sheraton/Starwood license the brand and manage the hotel for owner Sheikh Mohammed Hussein Ali Al Amoudi, a Saudi Arabian billionaire described by Forbes as the largest single investor in Ethiopia. The workers want to return to their jobs - with their union rights secured. Starwood has not responded to communication from the IUF. "Welcome to a world of golden sunshine, fine dining, water sports and entertainment, topped off with warm Maldivian hospitality on our own private island", beckons the website for the Sheraton Maldives Full Moon Resort & Spa. But hospitality at the luxury resort doesn't extend to workers seeking to exercise basic human rights. Since the IUF-affiliated TEAM recruited a majority of Full Moon workers in February last year, management refused to formally recognize the union or meet with the union committee and initiated disciplinary proceedings against the union secretary. On April 19, 2014, the union sent a written request to management to discuss the unjust treatment of their union secretary. They received no response, and gathered in their staff area to protest. On May 14, off-duty union members went to the General Manager's office to request a meeting, found the office empty, and peacefully awaited his return. Police arrived, began questioning union leaders and then issued orders to clear the premises. The following day, May 15, the union President, Secretary and an executive member were issued disciplinary letters accusing them of unlawful assembly and illegally displaying union banners in the staff area on… April 19! That evening they were issued termination letters in the presence of police. Since then, a total of ten union leaders have been terminated from their employment and more than one hundred members have received the same disciplinary letter. Since the resort is a private island, union officers cannot set foot on it to meet with members without violating trespass laws. The company has not responded to written communication from the IUF. In Ethiopia and Maldives, Sheraton management is trying to eliminate trade unions with brutal methods designed to inspire fear: disciplinary procedures, intimidation, mass dismissals. The company refuses to respond to communications from the IUF, and apparently believes it can callously violate international human rights standards with impunity. 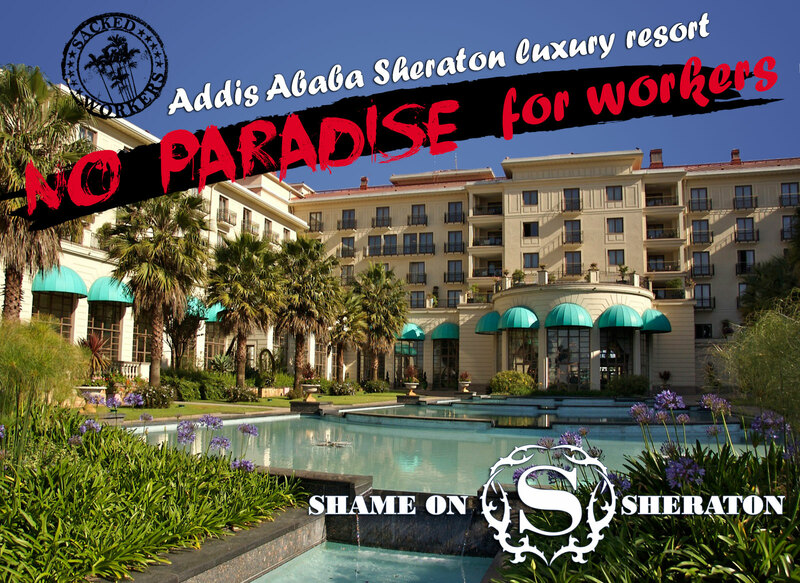 Shame on Sheraton! CLICK HERE to send a message to corporate Starwood management telling them to clean up their act, recognize union rights and talk to the IUF about remedying human rights abuses.